Greetings from Romania, where the spring sunshine is beautiful and nice to feel. The winter has passed and green shoots are appearing on the trees. The sun has warmth and we can look forward to longer, brighter days. What a beautiful season we are in! After several weeks away in America and England, it was great to be back in Romania around the middle of March. I have not known such a busy start to the year for many a year, and since landing in Cihei – it hasn’t slowed for a minute. Today I was in Dezna where so much activity is taking place. In the building we have many changes being undertaken and I confess to getting very excited with how wonderful the facility will be when completed. This morning I met with Landscapers for the huge gardens and made plans for BBQ Patio area, Camp Fire and the Prayer Garden. So much being planned brings with it a growing pressure on meeting the cost of all the facilities. Just today I committed to over £6,000 ($7,800) of work and I’m wondering how and from where the Lord will provide. I’ve also had very important interior items to order such as all the linens for the bedrooms which amount to more than £3,000 ($3,900). Then this week I spoke with the supplier for Beds and Mattresses for 52 residents and another £4,400 ($5,720) was quoted. We now have over 200 children booked for the summer Camps and it is critically important we get everything in place by June. I know the Lord will provide, but I have no idea at this stage from where! Can you help? Would you like to be a provider for this amazing facility that will provide a Mountain Top experience for young people to draw closer to God this summer? Please consider a special gift for the Dezna work. Telephone the office to make a gift by Card. Send your gift through the post or go on-line now to make a difference that will have eternal results. 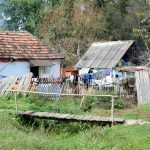 In April we start our Mission Trips for 2019 and I am thrilled a team is arriving April 13th to help with work in Dezna. A team of painters will be hard at it, starting on the top floor and making as much progress as they can through the 30 rooms of the residential floors. While they are busily painting, our contractors will move to the ground floor, starting work on the Kitchen refit and then the building of the new Laundry. The work will continue for months yet, so please help support as you are able or plan a major fund-raiser in the coming weeks to make a significant contribution to the target. Thank you. I have been pleasantly surprised at the response received of kids wanting to attend Camp in Dezna. Well actually, not so much surprised they want to attend, but that other organisations and churches want to bring them! We currently have over 200 kids wanting to come this summer. 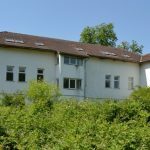 We have to underwrite £70/$90 per child to have a week of Camp in Dezna. Some can pay or contribute to this cost but unfortunately – many cannot. Would you help sponsor a child to attend Camp? 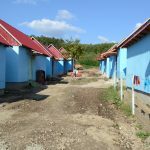 I believe it could change their life, and I know the experience in Dezna is going to be very special for those able to go. If you can help, donate you gift and designate it to ‘Dezna Camps’. Telephone the office or go to the website. 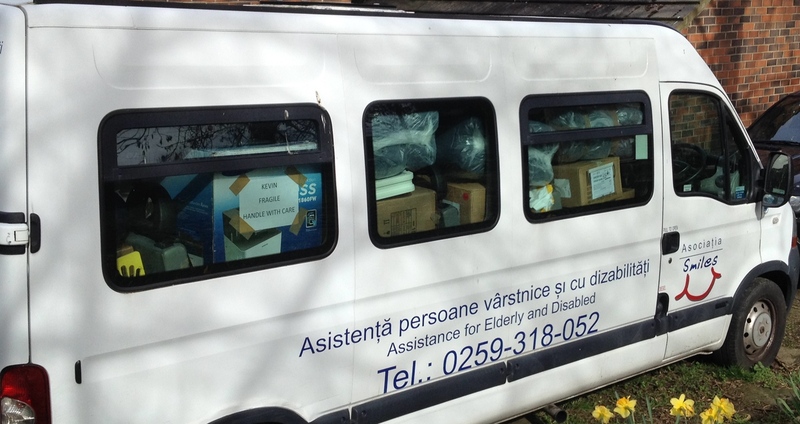 Some of the new supplies purchased in England arrived in Romania on March 28th when Darren Charles kindly drove the Disability Bus back to Romania. It was full to the brim with supplies, many items had been donated by loyal supporters who study our wish-list and buy or collect accordingly. Our sincere thanks Darren. The Container is currently about two-thirds full, so we have about 5 weeks to fill the rest of the space with critically needed supplies. If you can assist, please contact me or call the Leeds office to share your desire to help. We will truly appreciate it immensely. As I reported last month, a lot is happening day by day with our Field Project and we have offered appointments to two new people to join the team in April. We are praying they will be able to accept our offer and next month I will have some truly exciting news to share of the expanded Field Project team. It has been an exciting month for various projects who have been engaged with creative activities for celebrations in March. Take a read of Maria’s report this month focused on JOY and read of some great activities our children have been involved with. They really are a talented group. Alina was quick off the blocks with ‘Hair Clippers’ that were in the minibus that only arrived Thursday night. 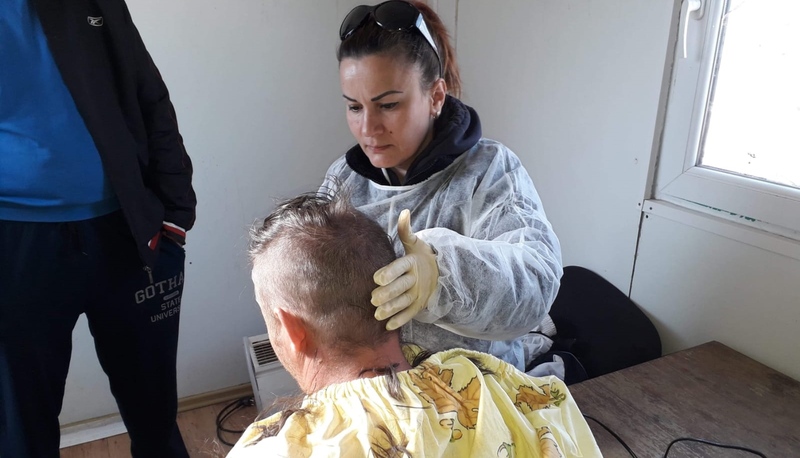 By Friday afternoon she was cutting hair for the Homeless community in our Container Village. They were so thankful and I had no idea Alina had a further skill in her repertoire. So Mission Trip guests – if you need a trim while with us on mission, I’m sure Alina will oblige for a small donation to the Field Project!! I am pleased to publish our latest ‘Thankful Heart’ video from a resident at our JFL facility. 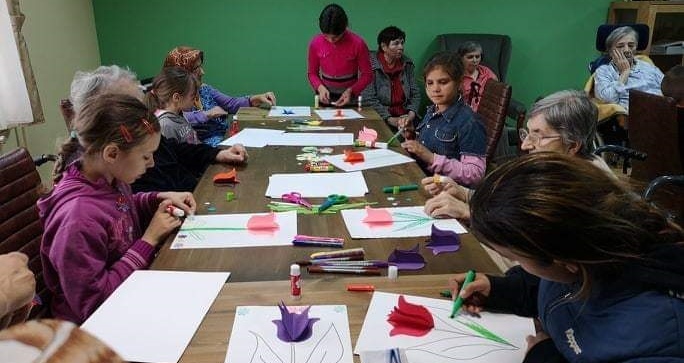 (Joint Facility of Love, Salonta) Many of you will know this month’s featured guest, but every time I hear her testimony, I am moved to appreciate the small part we have been able to play in her improved life. Whatever difficulties and challenges may come our way, Joy in the Lord will always put things into prospective. Felicia certainly does that for me. Enjoy the video, pictures and write up on Felicia. She considers herself very fortunate to live at JFL and is often wanting to help others who struggle to afford the costs. If we can assist those at JFL or our other residential homes whose residents can’t afford the costs we do so knowing we help provide the Christ Loving Care we consider so vitally important. We continue to receive enquiries from those interested to be part of the Official Opening of Dezna Outreach Centre the weekend of September 28th/29th, 2019. Remember – there are two options on offer for attending the Official Opening. The 4-Day weekend – to arrive Friday September 27th and return Monday September 30th. Or the 9-Day Mission Trip – Arriving September 21st and returning Monday September 30th. Please contact the Leeds office (0113-276-5060) or e-mail info@thesmilesfoundation.org for further information on booking. Don’t forget, anyone booked on another Smiles Mission Trip, anytime in 2019, will receive a voucher for free attendance for the 4-Day Official Opening weekend. 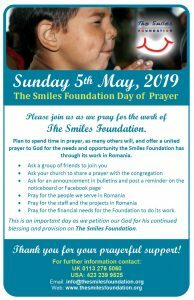 A further advance notice I would like to reiterate is the Smiles Prayer Day scheduled for May 5th, 2019. We are asking supporters to encourage a Prayer gathering that day, maybe secure a Church moment during the service, or even pause a few minutes by yourself during the day to specifically bring the work of Smiles before God in prayer. Remember the projects and people we serve. The staff working within Smiles to do the best they can. And pray for the finances and support needed to fulfill the huge demands upon us day by day. Remember to share the need for prayer with your friends and family. Remember – when you pray, God hears more than what you say, answers more than we ask and gives more than we imagine in His own time and in His own way! 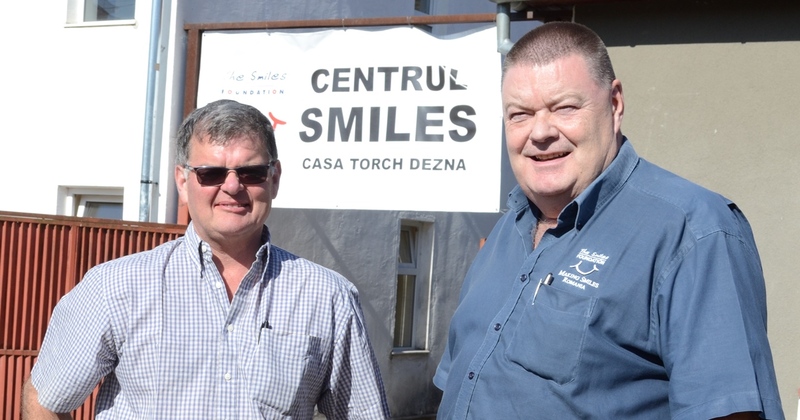 I thank you all for continuing to support the Smiles work here in Romania – for partnering with us to make a difference to the people of Romania through the Love of God. I appreciate your prayers which are felt every day. I know it is wonderful to share your resources with those less fortunate and that is what you do through supporting the work of Smiles. I encourage, even urge you to come and see the work for yourself. Meet those we are trying to help through families in need, the homeless and marginalised, the old, sick or disabled. All are precious in God’s sight – so let us be His Hands and Feet as we share His Love with them all. Thank you and sincere blessings on you all.